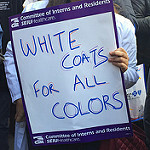 The Committee of Interns and Residents, the nation’s oldest and largest union of resident physicians, stands united with our brothers and sisters in SEIU and people of good conscience everywhere to ensure that the criminal justice system holds all people equal under the law, regardless of the color of their skin. As people who chose a healing profession, it devastates us to see people of color victimized by the very people who are supposed to protect and serve our communities. The grand jury decisions in Ferguson and New York City not to indict the officers who killed Michael Brown and Eric Garner are glaring reminders of how far we still have to come to achieve racial equality in so many aspects of our society. For years, the American healthcare system has observed persistent inequalities of care for people of color, for the LGBT community, for low-income working families, and for immigrants, both documented and undocumented. We have walked through the sun-drenched, glass-and-marble atriums of well-resourced academic medical centers and through the shoddy metal detectors in safety-net hospitals serving mostly low-income communities of color. In the past week, many resident physicians who are too familiar with healthcare inequality were shocked and enraged to see that same inequality in our criminal justice system as well. But some of us were not. We have seen it in the way our co-workers, our peers, colleagues, our families and our friends are treated. We have seen it in the brutal treatment of patients with behavioral problems, mental illness, and substance abuse, sometimes mere seconds before they become our patients. Racial injustice is inhumane in healthcare. It is detrimental in the criminal justice system that is supposed to protect all of us. This is not a black issue or a brown issue or a white issue. This is a human rights issue. It is a moral imperative that all lives have the same value in the eyes of the justice system, and that the laws of our country are enforced equally in every community. Our patients matter. Black lives matter.